On the Road at Sunrise is for this weeks photo challenge The Golden Hour. I know I skipped last weeks challenge, sorry. Here are a few beautiful sunsets on the water taken for last months challenge Fleeting. I have no photo of my head in the sand, which would be appropriate while admitting I do not want to deal with my current reality. My mother is ill… critically ill and I am a “mama’s girl” which I admit without shame. I am trying mother. And here is my submission for this weeks photo challenge : Escape. I am not a numerology freak by any means but I do find the theory fascinating at times. Coincidental? Maybe. Wishful thinking or superstition? Idk. When it’s good news I [like anyone else] want to believe it. When it is doom and gloom I tend to say ah phooey! Today the numbers 1 and 2 have occurred repeatedly, the digits of the day so to speak. Good thing for a new indie in my opinion (yee-haw) according to my August stats sales for Amazon USA 222 copies of Between the Rage and Grace had sold. 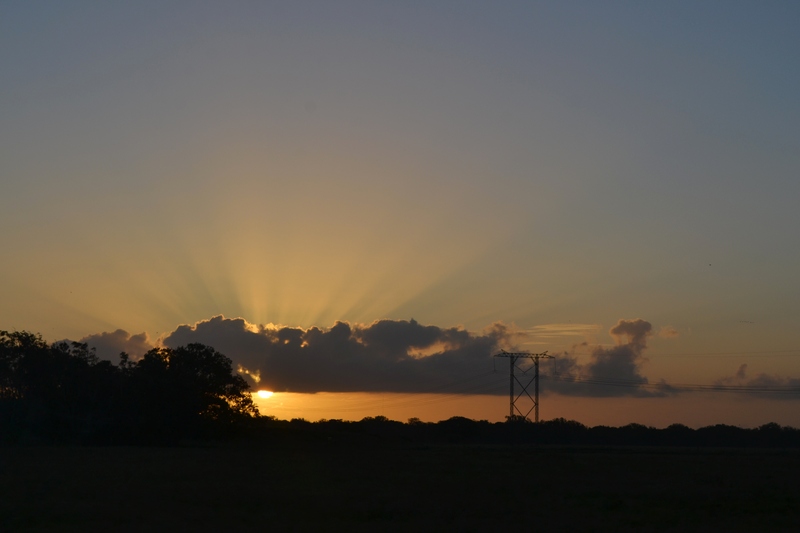 Sunrise over South Texas as we began our journey northward home. I know many other numbers flashed before my eyes as we made our way home but oddly it was the numbers 1 and 2 that caught my eye. If it means anything at all … maybe it is the Yin and Yang. Maybe the moral of this story is slow down, pace yourself, it’s gonna be okay.